I really like the crisp clean look of this outfit. 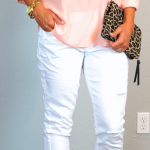 No signs of fall yet here in hot muggy Florida so still embracing breathable light fabrics. 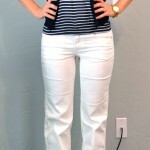 I think this outfit would be a cute one for a casual work day that transitions into a casual date night with the hubs. Applause for your comment. I feel the same way about day to night outfits!! As soon as I saw this outfit I thought of Queen Letizia (she just wore it this week and it was a repeat). Haha, I agree…its not really a day-to-night look if you're changing the whole look! This skirt looks fantastic with the crisp white shirt.